Above-average rain projections mean even more truck driving in heavy rain. Thankfully, you can be even more prepared for rainy roads with these safe driving tips adapted from Schneider’s SMART Defensive Driving training materials. NOAA (the National Oceanic and Atmospheric Administration) is projecting “historic, widespread flooding to continue through May” in its Spring 2019 outlook. So, it looks like this year, April showers bring May … showers. Get ready, and drive safely and confidently. What about truck driving in other weather conditions? Take five minutes to check the weather along your path. Check out weather forecasts online, via radio or through Schneider’s new traffic and weather app (available now on company-issued tablets by searching “weather” on Compass; you’ll hear more about this soon). Be particularly aware of the potential for flash flooding during heavy downpours or freezing conditions when temperatures dip down. Rain from the day before may have frozen overnight. Check DOT maps for possible road closures from flooding. Plan ahead to avoid such areas. Be aware of possible alternatives if forecasts suggest you may enter stormy weather. This goes for any weather conditions, but an equipment problem could be even worse in poor weather conditions, so make sure your truck and trailer are safe and in good condition. Do not let air out of your tires to gain traction on wet roads, as tires are at their optimal performance when fully inflated. Ensure that you have proper protective gear packed for each season, and for the climate conditions where you’re driving. It might be 70 degrees and sunny where you are, but are you ready for 35 and heavy rain somewhere else? At least have a jacket that can handle rain, along with emergency food and water. At Schneider, we tell every truck driver: you are the captain of your ship. If conditions are not safe, you can decide to stay off the road. Take five seconds to turn your phone to “do not disturb” before you begin driving and leave it out of reach from the driver’s seat. Get your GPS navigation set up. Situate any beverages or snacks. Set yourself up for maximum focus on the road. This is a requirement in any weather condition! It’s just as important for other motorists to be able to see you as it is for you to see them and the road — this goes for driving in rainy conditions both at night and during the day. You can monitor stations that provide weather updates so you can get any alerts on the latest weather conditions without being distracted. The volume shouldn’t be too loud that you can’t hear what’s going on around you (e.g., emergency vehicles). Accelerate or decelerate slower than you normally would to prevent traction loss. Heavy rain can quickly reduce traction — did you know: 1/12 inch of water forces tires to displace a gallon of water per second to maintain contact! Turn around, don’t drown! Even a small amount of moving water can wash away a vehicle, and the water obscures your vision of hazards. Plus, you have no idea how deep the water really is. What if the road underneath has been washed out? Just don’t do it. Yes, that could mean a 20-plus mph speed reduction to maintain control! 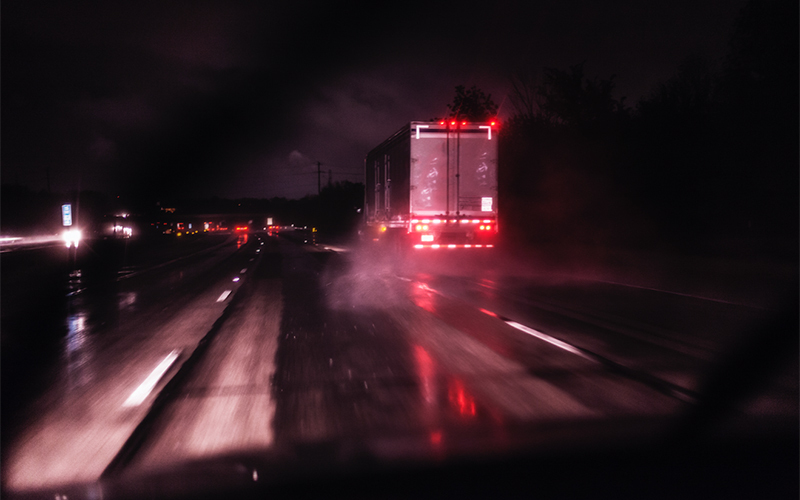 According to the FMCSA (Federal Motor Carrier Safety Administration), 25 percent of speeding-related large-truck fatalities occur during adverse weather conditions. 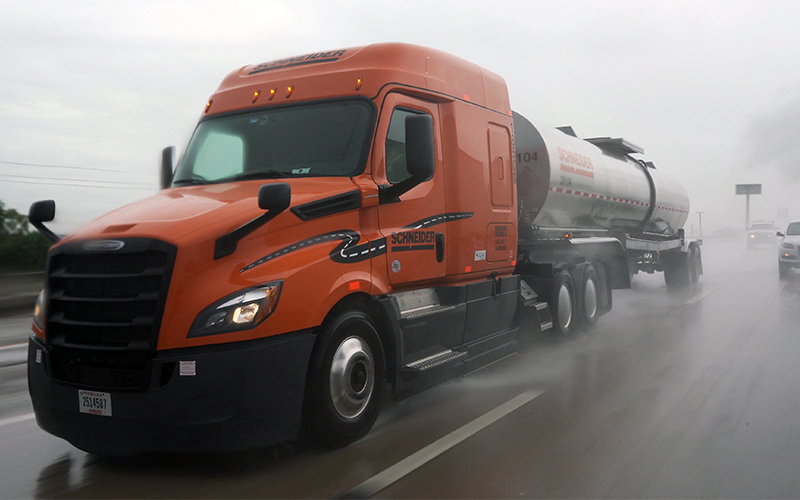 Schneider recommends seven seconds of following distance in good conditions, and you may need to add to that in rainy conditions. Using cruise means you lose the feel of the road and may not sense hydroplaning, and your engine brake (Jake brake) on wet and slippery roads could result in loss of traction. If you are not comfortable with the situation, get off the roadway safely (not on the shoulder, but in a safe parking lot) and take a break until conditions improve. Let others know where you are and that you are safely parked. Are you ready to drive for a company that puts your safety first — in all weather? Search Schneider’s driving opportunities near you. Do you have any questions about truck driving in heavy rain or advice based on your own driving experience? Comment below. Dan Drella is a Director on the Schneider safety team. Dan is accountable for safety for the Intermodal, Logistics Transportation and Logistics Transloading and Distribution areas. He has been with Schneider for 17 years working in various areas, including equipment management, rail management and finance. Will Schneider make you drive in bad or unsafe weather conditions?